Another day – another teaser of a dressed up ride heading to the 2012 SEMA Show but today we get a look at a car typically ignored by those building high dollar show cars for SEMA with our first glimpse at the Chevrolet Malibu Turbo Performance Concept. The 2013 Chevrolet Malibu has been fully redesigned with the introduction of the new Malibu Turbo really being the first performance-oriented trimline in the modern area of the Malibu name…which makes it a perfect choice for a SEMA Show vehicle. The drivetrain of the production level 2013 Chevrolet Malibu Turbo has remained relatively unchanged aside from a concept cold air intake but with 259 horsepower from the turbocharged 4-cylinder engine, the ability to dash from 0-60 in 6.3 seconds en route to a top speed of 155 miles per hour makes this the quickest Malibu ever according to Chevy. We don’t know how much difference the cold air intake makes in terms of power improvements but this new turbocharged engine option packs enough power to fit in with the SEMA crowd in near-stock form. The main attraction for the Chevy Malibu Turbo Performance Concept is the physical design and that begins with the tricked out exterior. The Chevrolet engineers began by adding a unique ground effects package that includes an aggressive front splitter, extended rocker sills and a rear diffuser with integrated exhaust tips – all of which are finished in “Heroic Blue”. The lower grille opening and the grilles around the fog lights have been swapped out for an “egg crate” design while contrasting bright red trim pieces replace the standard chrome on production models. We see more of that red trim on the large brake calipers and around the integrated rear exhaust tip openings while the rest of the exterior chrome trim has been replaced with “black ice tinted chrome”. Next, the Chevy Malibu Turbo Performance Concept sports a set of clear tail light lenses, a set of 20” sport rims coated in a finish that GM calls “Night Rider chrome” and a set of Turbo badges on the doors. Based on the renderings, these Turbo badges look like a feature that would very comfortably fit on a production model although they might be a little “too Buick” with the bright red T. Finally, this high performance Malibu Turbo Performance Concept is finished Berlin Blue Tricoat while a large windshield banner announces that this is indeed a Chevy Malibu. Inside, the Chevrolet Malibu Turbo Performance Concept continues the black and dark blue theme beginning with a set of race ready Recaro sport seats that are wrapped in Jet Black leather and dark Navy Blue suede with red accent stitching. The same leather and suede is also found on the door panels, across the instrument panel and on the sporty flat bottomed steering wheel. Finally, as is the case with the exterior – the interior chrome trim has been replaced by a variety of panels finished in either Dark Argent or black chrome. Further improving the performance of this 2012 SEMA-bound 2012 Chevy Malibu Turbo Concept is a Chevrolet Performance concept sport suspension package that includes HiPer Strut front suspension and rear springs, a big brake setup behind the front wheels featuring 6 piston calipers and massive cross drilled rotors and last but not least – a set of Pirelli PZero 255/35ZR20 high performance tires. 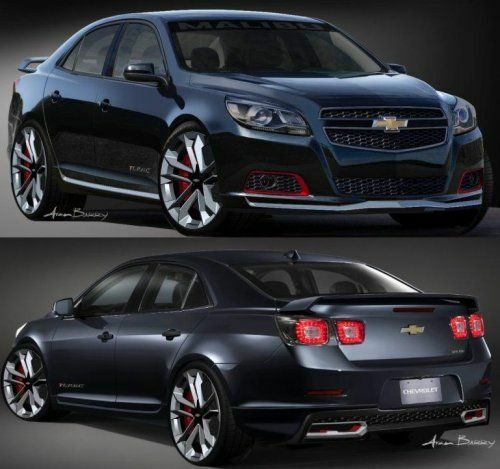 The Chevrolet Malibu Turbo Performance Concept will make its grand debut in just over a week at the 2012 SEMA Show in Las Vegas and TorqueNews will be there covering the event live – bringing you the hottest cars and the biggest news from the Vegas Convention Center. We have now gotten a look at the compacts and the Malibu sedan headed to SEMA which leaves many Bowtie enthusiasts wondering "where are the Camaros"? We are wondering the same thing but even if GM chooses not to tease the Camaro models coming to SEMA - they are no more than 8 days from being unveiled in Vegas. This is how the regular Malibu should look.